All of my Favorite Things GIVEAWAY: KitchenAid 5 Speed Hand Mixer! It’s a SPECIAL All-of-my-Favorite-Things GIVEAWAY! To celebrate all of the support and recognition I’ve received from all of my followers (YOU), I wanted to do something I’ve never done before! A two part giveaway featuring a few of my favorite kitchen accessories! Since I have a rather small kitchen, every inch of counter space and storage space counts. Particularly when it comes to storing and displaying my favorite baking tools. So I tend to like small, pretty things. Like this KitchenAid 5 speed Hand Mixer. Point in case, not only do I have my beloved KitchenAid Stand Mixer (which I use about 90% of the time with my recipes), I also have one of these super functional KitchenAid Hand Mixers, as well. For all of the quick, little jobs. Because I LOVE (LOVE) KitchenAid products! From size, to versatility, to functionality & (beautiful) design, KitchenAid products tend to be my go to for everything I do! Brownies, cakes, cookies, muffins, you name it! I LOVE KitchenAid! 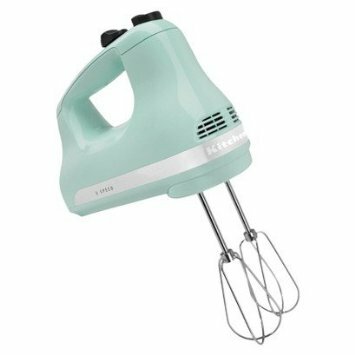 Hence my 1st All-of-my-Favorite-Things GIVEAWAY today for THIS lovely ice blue 5 speed hand mixer! But enough with the gabbing! Let’s get to the details! Here’s how to enter: leave a comment below with your favorite kitchen accessory (& a link to it, if you’re so inclined to share it with us) and tell me why you love it! Commenting begins today, Sunday, February 15th from 1:00pm-1:00pm on Monday, February 16th. One lucky commenter will be chosen at random to receive this fantastic KitchenAid Hand Mixer! Winner will be contacted on Tuesday, February 17th. From my Heart to your Kitchen, THANK YOU for all of your support! « Happiness Project#52: Raspberry French Toast Rolls! My favorite is my kitchen aide standing mixers! My favorite kitchen item is my waffle maker it makes belgian waffles and they come out so delicious I love it because its so easy to use and my family loves to wake up to yummy fresh waffles. My favorite item would be the digital food scale. Makes measuring ingredients so accurate and easy. Thanks for the giveaway! My favorite is my mini electric chopper. My family loves guacamole. I’d be lost without it!